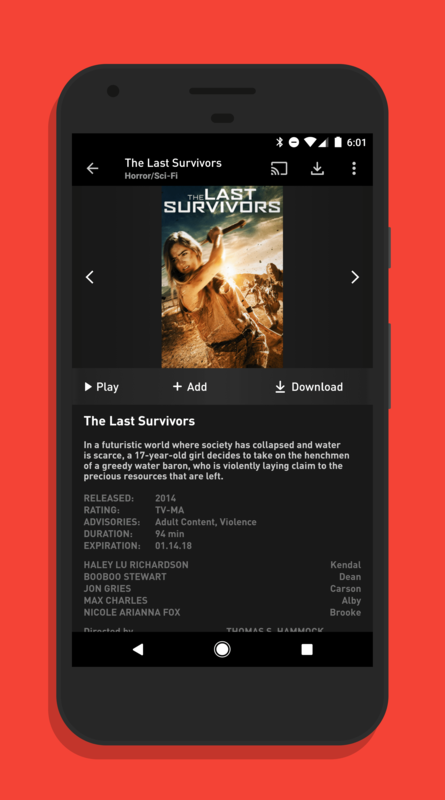 The premium movie service Showtime has released an update for their Android app that gives users the ability to view movies and shows offline. The new feature allows you to download content to your Android phone or tablet so you can view that content offline. By default, the app will continue to stream content when you view it but now you have the option to download it and take it with you for situations like car trips or plane trips where you don’t have access to the Internet for streaming. The new feature is simple to use. Just find the title you want to view then tap the download button. This will download that movie to your phone so you can view it later. There is also a new downloads section in the Showtime app that shows you all of the content you have downloaded to your phone or tablet. Keep in mind that downloading on your phone will give you a maximum resolution of 720p while on a tablet you can download in 1080p. This is due to screen sizes and to save a bit on storage space on your phone. download for offline viewing so you can download shows like Weeds as well as movies offered by the service. If you do not subscribe to Showtime, you can do so through the app. It is $10.99/month and there is a free 7-day trial you can do to check it out and see if it is right for you. Get more details on the app in the Play Store. If you do subscribe through your cable provider, you need to get the Showtime Anywhere app and use your credentials from your cable provider to login. The Anywhere app also has the ability to download content.